4" long, 8 pack. Garlic & Salt Impregnated. 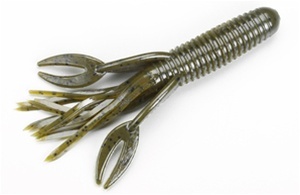 The 4" Craw Tube features a ringed body and a pulsating skirt that creates a natural breathing action; and, the two "craw pinchers" imitate the defensive stance of a live crawfish. The Craw Tube is the ultimate flipping tube when rigged on large tube jig heads or worm hooks. The Craw Tube's two large "craw pinchers" move more water in a swimming action that attracts fish whether the lure is on the fall, bounced along the bottom, or swimmed on a slow retriever. All methods imitate a live crawfish trying to escape.